If you are, like me, a United States citizen, then you, like me, are aware that we are a nation of fatty fat fatties. Seriously, we like our fast food and we like it super-sized, greasy, and on the regular. The Internet just goes hand-in-hand with this gluttony. I’m a healthy person who runs every day and drinks the appropriate amount of water, but there’s something about a a Netflix-binge while trolling Reddit AMAs and GIF blogs from my laptop that makes me want an impressive amount of Taco Bell (Crunch Wrap Supreme and two Meximelts no pico sauce, please and thanks!) laid before me. Heaven is some multi-screen overdosing accompanied by fourth meal, I swear. So while I won’t judge you souls who want an infinite supply of Mountain Dew to accompany your hours-long COD sessions or a jumbo supply of Sour Patch Kids to absentmindedly eat while you stare at your online homework, I will call out the suppliers who are preying on our salt and sweet cravings with yet more technological bait. To wit, Chili’s has tested tabletop tablets so that you can keep on ordering even if your waiter or waitress is otherwise occupied. Yes, there is a convenience factor: You can immediately order and pay without human interaction, so after shoveling mozzarella sticks and a Triple Dipper into your mouth – salad on the side – you can get the eff outta there (to go buy a lifetime supply of Tums). I promise, I will consume your terrible foods, no need to shove a tablet under my nose to make it easier. But – shockingly – the idea is also to get you to buy and thus eat more of the product. It’s like little kids with those iPhone games; $20 for a new sticker? I want seven! According to a report, Chili’s execs said “dessert sales increased by as much as 20 percent” and a jump in the per-person average of the checks. Because who needs social shame when they want to order that second brownie sundae? The most famous purveyor of fast food burgers, McDonald’s, is testing a new mobile payment app so that you can order your meal before even going through the drive-thru. Then, you can just drive-thru and pick up food. Because who has time to wait 30 seconds for a bag of burgers? 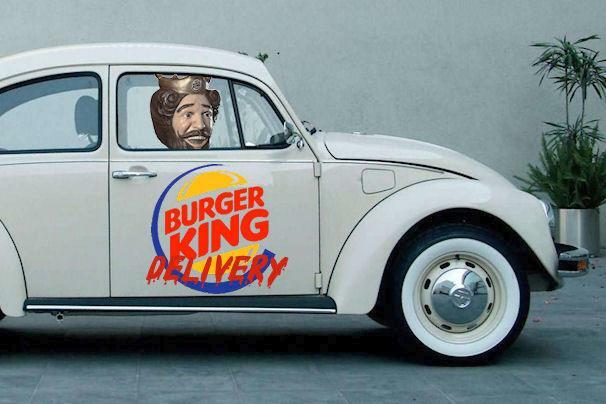 In perhaps the most ambitious ploy of them all, Burger King is testing a delivery service in select areas. Customers can order online or by phone between 11 a.m. and 10 p.m., as long as you’re buying at least $10 worth of BK (which is a lot of BK). Apparently it’s boosted sales. Because who wants to actually leave their house after a bout of day drinking and subsequent craving for The King? I’m not preaching some crazed message that we should all shop at Whole Foods and cut out carbs and do crossfit (ugh) and do the whole paleo diet thing (also, no, never ever ever ever). I’ll be completely honest: It’s 10 a.m. and I’m eatingchocolate covered gummy bears – because I’m writing this article and working, and having something to mindlessly gnaw on is part of the creative process (I’m pretty sure, look it up). But that’s the problem. There are, oh I don’t know, say a million different things that are already there to encourage me to eat horribly. I already look at a screen enough, OK? I promise, I will consume your terrible foods, no need to shove a tablet under my nose to make it easier. Easier, and more discreet. The subtle shame of having to say out loud “I would like… four Whoppers” is gone if you order online and get delivery. That third sugar-laden appletini might be embarrassing, but if you can tap your way there, then by all means, get yours! Maybe some barriers are OK to have. If you want these foods – or a superfluous amount of them – you have to have the balls to own up to wanting them, not hide behind an app. It’s the only thing separating us from the human society in Wall-E, right? Let’s just save a tiny ounce of self-respect. This is why we’re hot fat. Of course Google's founders want to 'solve death' – they're rich!